The position of the thwarts in each boat is different. 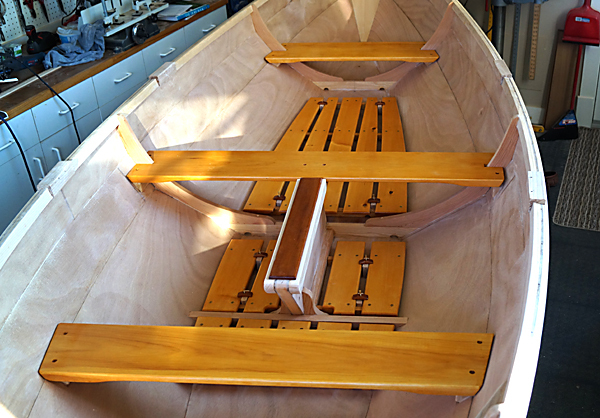 My boat will primarily be rowed as a fixed seat double. 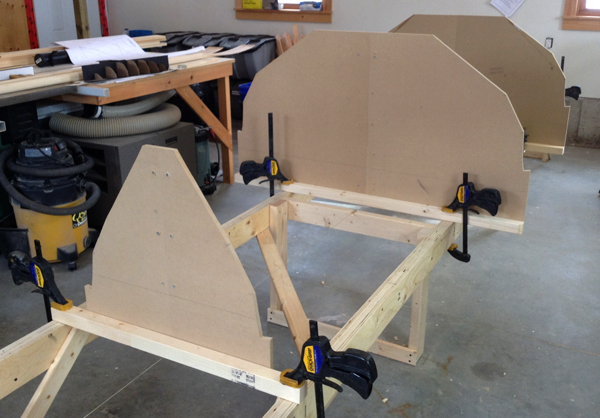 A secondary setup will include the addition of a Row Wing sliding seat rigger. I have changed the layout of the seating from the drawings by moving the thwarts to stations #3 and #5. This will improve the balance of the boat for both my rowing setups. 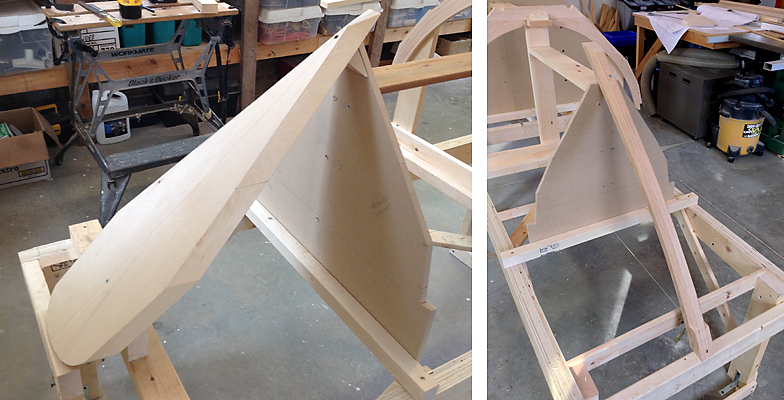 Don’s boat is being rigged for sailing so the thwarts are positioned as the designer drew them for the sailing version. 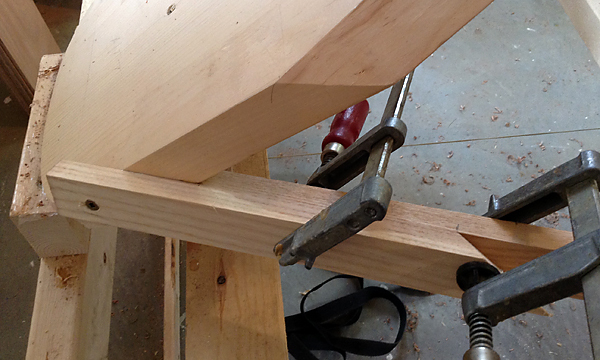 We installed the thwarts by first cutting the ends to match the bevels where they met the planking. Temporary screws driven from the outside of the hull held the thwarts in position while we fitted the seat cleats. 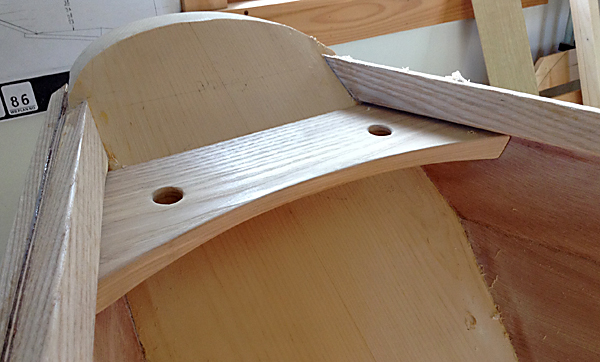 The cleats were then glued in place, also using temporary screws through the planking. The final step was to scribe and trim the ends leaving an 1/8” gap before screwing them into the cleats. 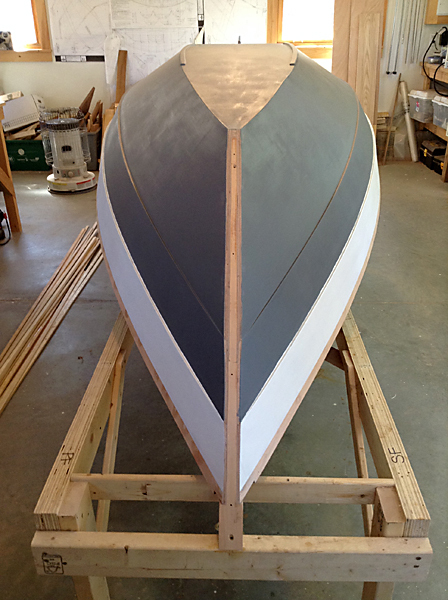 After sanding, filling, sanding and more sanding the hull is ready to be painted. 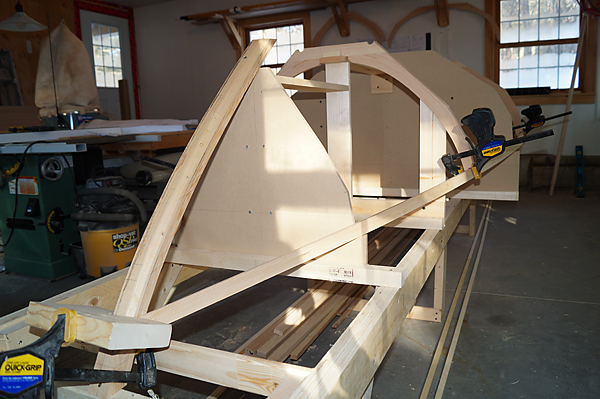 The transom and the top edge of the sheerstrake, where the outer gunwale will be attached, are masked off. Two coats of primer are applied with roller and brush, white for the sheerstrake and dark grey for the rest. One last job before turning the boat over is to attach the outer stem. 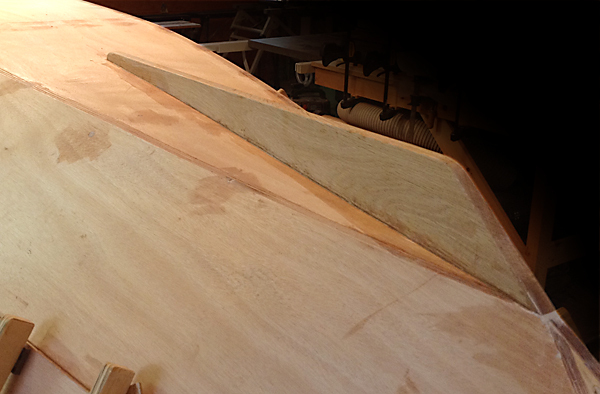 The width of the forward face and the aft side of the stem, where it meets the planking, are scribed. 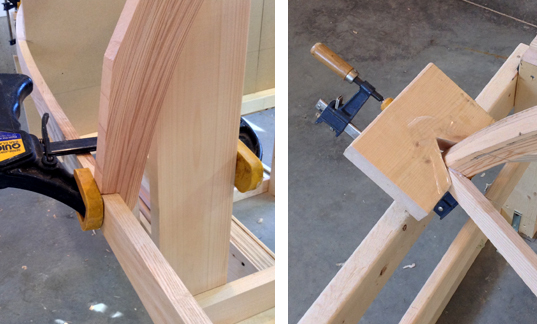 The stem can then be tapered on the bench before being glued, screwed and plugged. 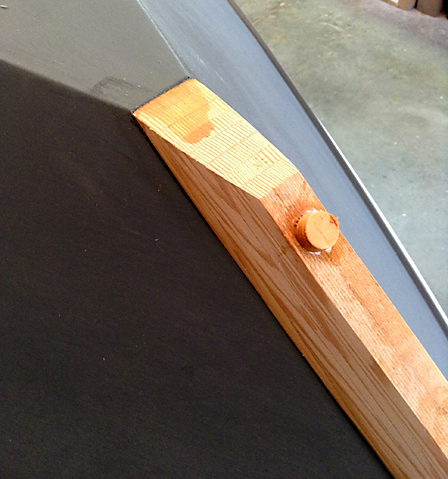 One advantage of epoxy is that it doesn’t require strong clamping pressure. On the down side, the parts being glued, can slip around if the pressure is not even. 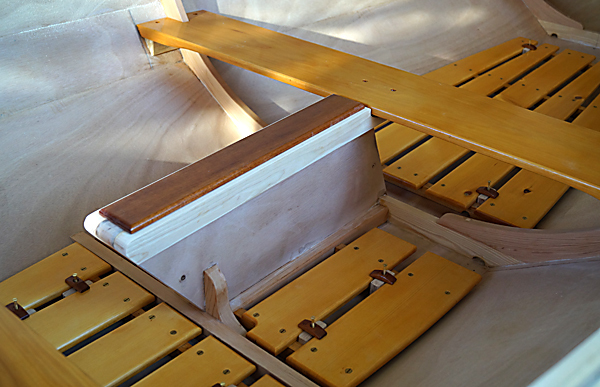 Fastening the skeg is one of those situations where traditional clamps cannot be used. Using screws driven from the inside is one answer but it is difficult with the boat upside down and the molds in the way. 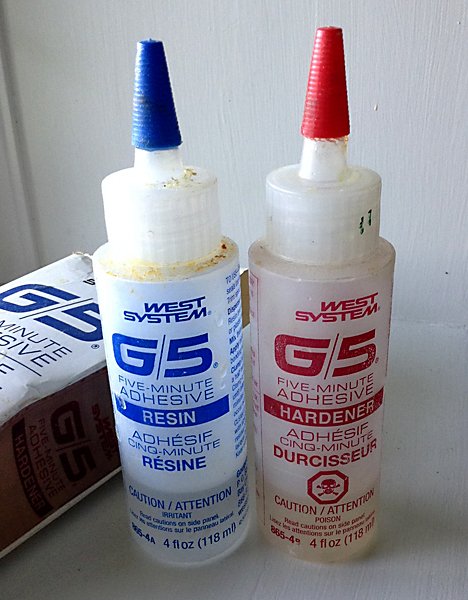 A simple method is to apply the regular epoxy adhesive to the joint but leaving bare spots near each end for dabs of 5-minute epoxy. 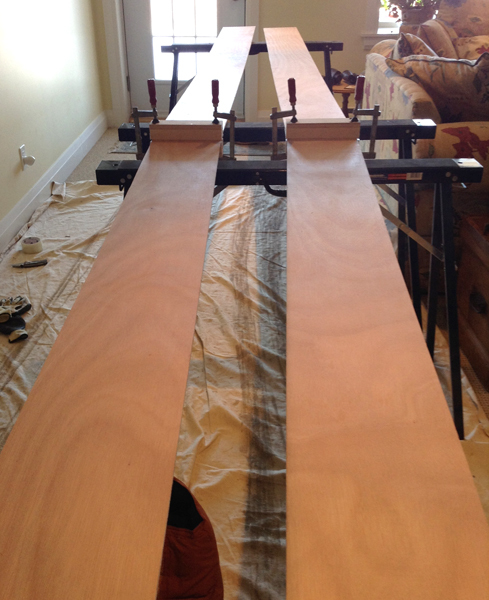 Hold the skeg in place for 5 minutes by hand until the epoxy hardens. Once the boat is turned over screws can then be added. 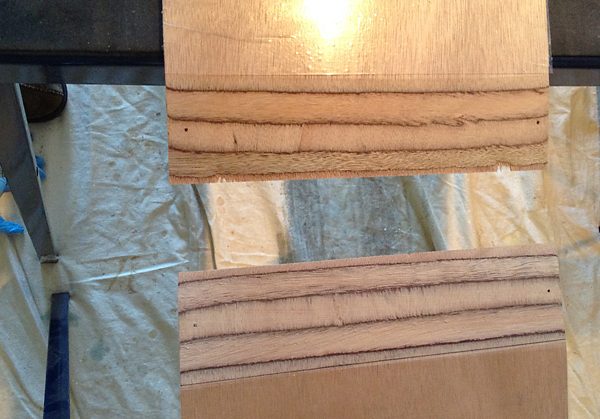 Once the planks were glued up, they were cut to shape using the full-size patterns. We used three different methods to attach the planks. 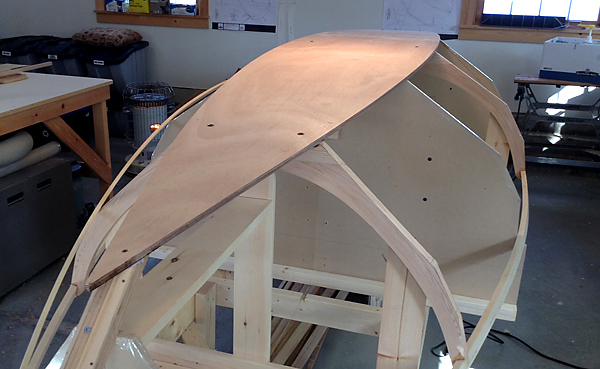 The garboards were screwed into the bottom panel using temporary screws, pre-drilled and driven in at an angle. 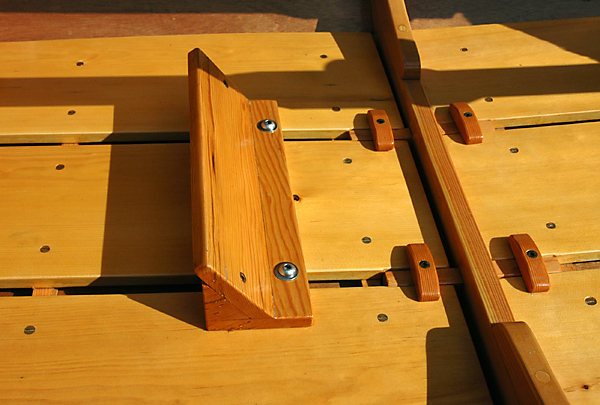 With the middle planks we were able to use plywood clamps and wedges. 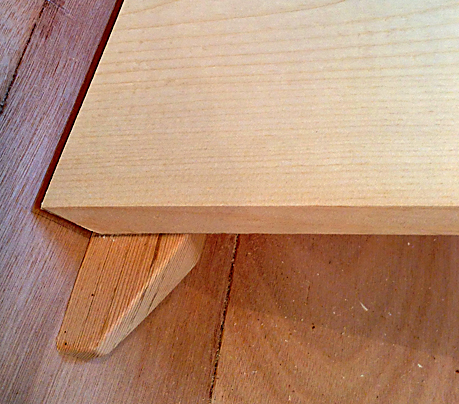 This method is excellent for glued plywood lapstrake planking but unfortunately was not possible for fastenening the garboards due to their width. Nor was this method suitable for the sheerstrakes because the sheerclamp was in the way. To attach them, we used temporary screws along the sheer clamp. 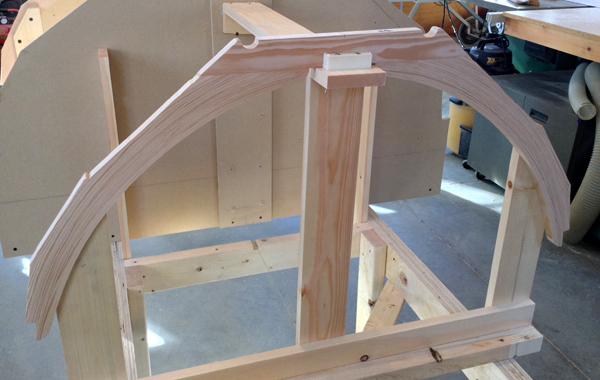 At the landing, a batten was fastened with screws and spacer blocks to the frames, stem and transom. 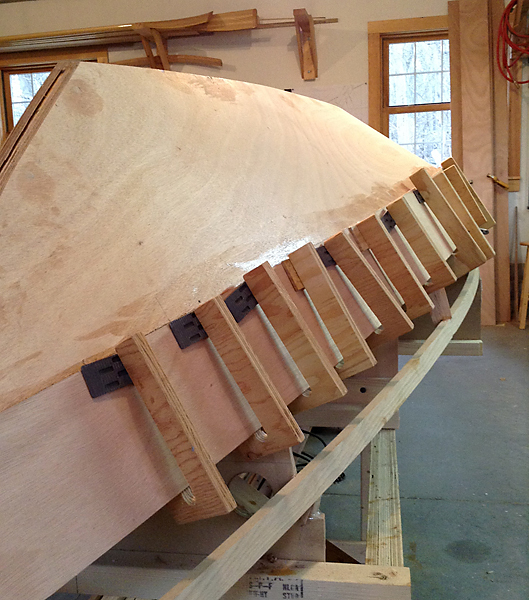 Wedges were then slipped in between the batten and the plank to apply pressure. Once the full size plank patterns are made, the marine ply is cut into strips, 16” for garboards and 8” for the other two planks. The patterns are layed over top of the strips to determine the angles for the dog-leg scarfs. 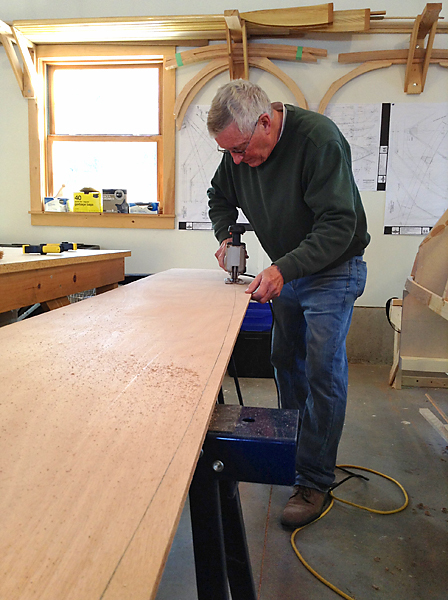 A power plane or jack plane is used to take off the bulk of the wood, followed by a sharp low-angle block plane. 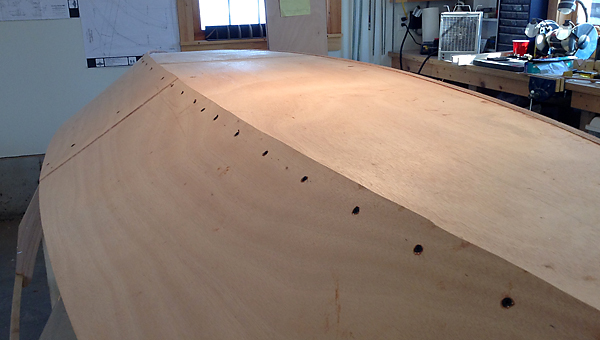 Planing the scarfs to a feather edge, without tearing out, is especially difficult with the paper-thin outer veneers on today’s marine plywood. 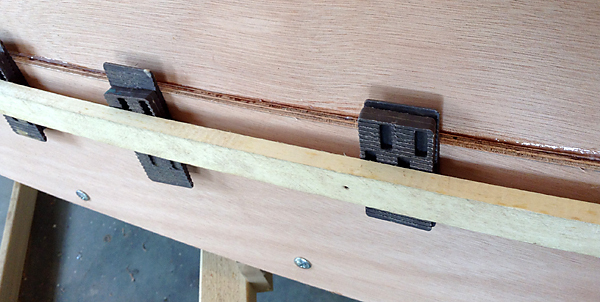 Small finishing nails are driven through the joints on each side to keep the pieces aligned when clamping. The garboards and middle planks required only one joint each but the sheerstrakes needed two scarfs each to make up the required length. 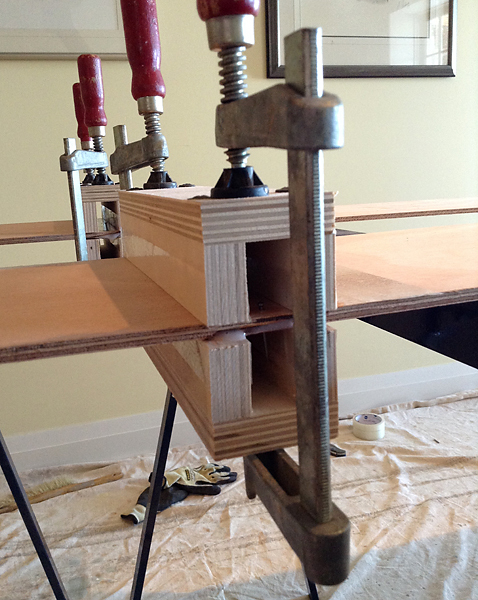 Channel blocks, the width of the scarf, are clamped top and bottom giving even pressure on both sides of the joint and they also allow the alignment nails to stay in place while clamping. Ready for gluing. Note: holes for registration nails. The bottom panel is the easiest of the planking to install. 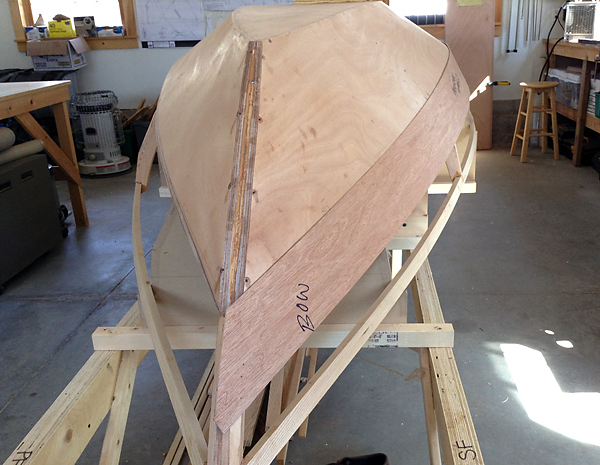 After fairing, the 2′ x 13′ scarfed panel is laid on top of the setup and the outer edges of the frames, molds, stem and transom are marked. 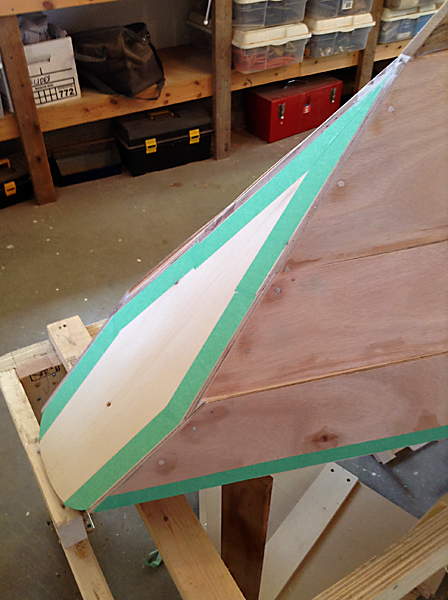 Using a batten, line up the marks, scribe the line and cut out with a jig saw. A few temporary screws hold it in place while the epoxy sets. 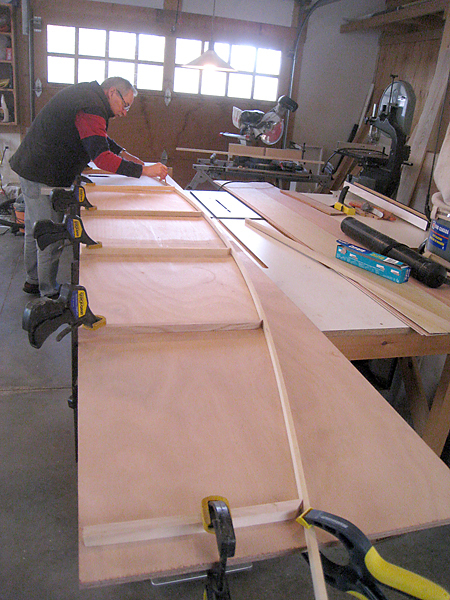 Next, the edges are planed where the garboard planks will be fastened. 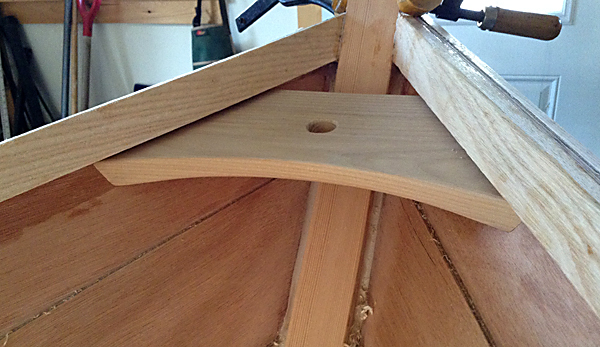 The last thing to be done before the planking starts is to fit the sheerclamps (inner gunnels). 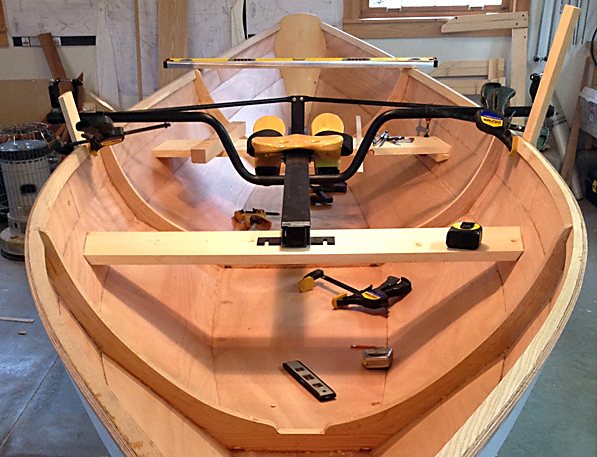 Usually they are attached after the hull is turned over, however, with dories they are notched into the frames and fastened to the stem and transom. Holding them in place while the epoxy sets is a bit of a challenge especially at the ends where they have a tendency to twist. 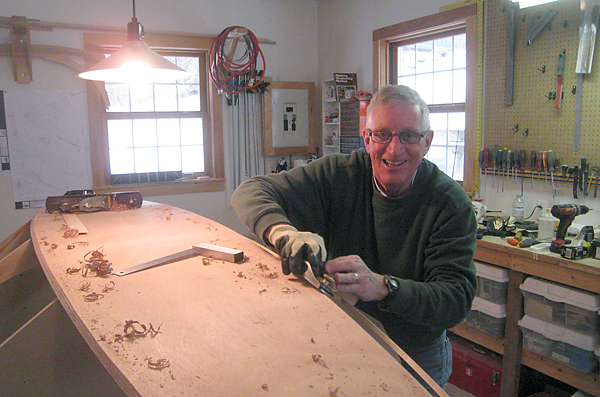 At the bow we used temporary screws with a “V” clamping block and at the transom we clamped a piece of wood to the outside of the sheerclamp which was then screwed into the side of the transom.